To get more sorely needed education funding in Colorado, policymakers have to prove to voters that schools are getting results, Gov. John Hickenlooper said. “At a certain point, I think, what the voters want to see is, if we’re going to increase taxes, what are we going to get for it? … I’m not sure anyone’s been able to demonstrate that to them successfully, that ‘Here’s how we’re going to use the money, and here’s the increase you’re going to get from it, the increase in performance,’ ” said Hickenlooper, a Democrat who will end his two terms in office this year. 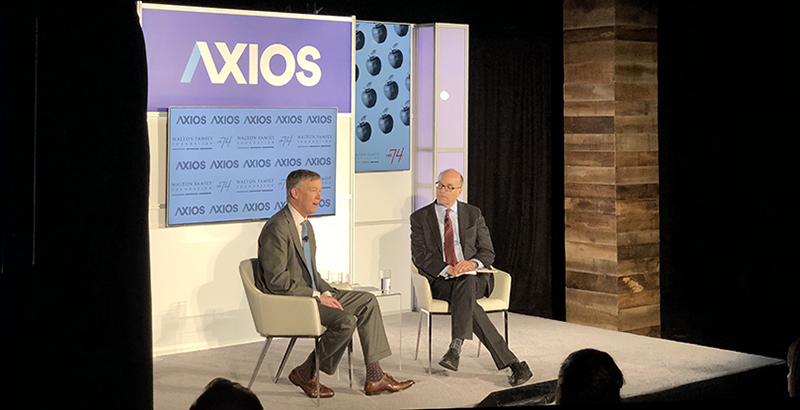 Hickenlooper spoke to The 74 ahead of his appearance at “Raising the Bar: A Conversation on Education in America,” an event moderated by Axios’s Mike Allen and sponsored by The 74 and the Walton Family Foundation. Gov. Roy Cooper, Democrat of North Carolina, and Kansas Republican Gov. Jeff Colyer also spoke at the town hall event. Hickenlooper, in his final “State of the State” address last month, said Colorado remains three-quarters of a billion dollars below school funding levels required by the state Constitution to keep pace with inflation and enrollment growth. All tax increases must go before Colorado voters, who historically have not backed most of them. The state spent $9,245 per student in 2015, according to Governing magazine, citing Census figures. That put it at No. 39 among the 50 states and the District of Columbia; the national average the same year was $11,392. That low funding “makes it really difficult for us to compete for teachers, to do all the things you need to make school districts,” Hickenlooper said. This year, he has focused in particular on rural schools, where teacher shortages are a growing problem, and has advocated for $10 million to $20 million in additional funding for recruitment there, he said Friday. Testing, particularly in the two decades since the passage of No Child Left Behind, has been the key metric for measuring schools’ success. But Colorado has been an epicenter of the opt-out movement, and state lawmakers prohibited the state education board from lowering a school’s ratings if fewer than 95 percent of students take required tests. That stance delayed federal approval of the state’s plan for complying with the Every Student Succeeds Act, as the law requires 95 percent test participation. Although Colorado did have “too much testing,” and testing used for teacher bonuses and compensation resulted in harmful “teaching to the test,” exams are important, Hickenlooper said. Most students would understandably opt out of exams if given the choice — the real hurdle is convincing parents of their merit, the governor said. 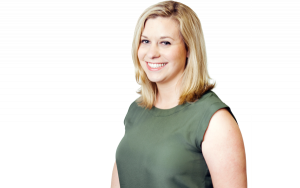 “The challenge here is, when opting out becomes acceptable to parents, then we’re in trouble. We need to reach out and begin that conversation with parents again, to say, ‘Don’t you want to know how your school is doing?’ ” Hickenlooper said. Many Colorado parents would praise their children’s schools and teachers while panning public schools writ large, he said. “There’s a big disconnect. That’s why we need assessment, testing,” he added. A key to improving education is also being willing to make big changes at schools that aren’t performing well, Hickenlooper said during the town hall event. “You’ve got to be willing to step up and try to provide the tools for a massive changeover. But in some schools, the culture is so bad you need to close the school, clean it out, and then reopen it. That has, in many cases, proven successful,” he said. Hickenlooper also talked at length about school safety. Both the 1999 Columbine school shooting and the 2012 Aurora movie theater assault occurred in his state, and he oversaw passage of several gun control measures after the Aurora attack. Training and background checks are important, but “having guns so available to so many people makes the task of keeping schools safe almost impossible,” he said. Hickenlooper also said he believes the country is at a tipping point on gun control. “We are allowing ourselves to be terrorized. If you were someone in a basement in Leningrad and you wanted to hurt America as badly as you could, what better way than to make our children feel that they’re unsafe in school?” he asked.